When it comes to personal finance people often seek help from friends, relatives or financial planners. For majority of people handling finance is complex job. They often seek answer of questions such as How to invest wisely? Am I secure against financial risk? What Principal of investment I should follow? So to help you out all these people I am here with Simple Principal of Investment. I call this principle as 30% rule of personal finance. Divide your income in to four part. First 30% of income for Investing. 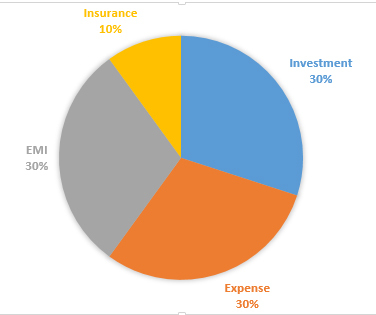 Second 30% income for spending and third 30% for EMI. 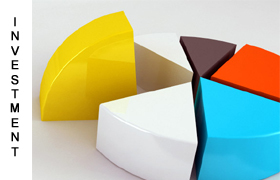 Rest 10% of income can be used for risk coverage. This means that if you are earning 10000 Rs/- as take home salary than 3000 Rs/- must be kept for saving and investment. You can keep maximum 3000 Rs/- for expense and 3000 Rs/- for EMI. Rest 1000 Rs/- can be used for life insurance and other insurance need. First thing you need to take care is develop concept of paying yourself first. Invest 30% of your income for your financial goals. You can increase or decrease this ratio based on your situation. Set automatic mechanism for investment or be punctual in terms of investing money. Before investing make emergency fund. Emergency fund should be at least 6 month of your household expense. Make monthly budget with categories. Try to limit your expense up to 30% of your income. One very good method to control expense is to divide your expense in to discretionary and mandatory. Now whenever you spend money ask simple question to self that whether this expense is really required. It is not advisable to take loan but in today with limited income it becomes compulsion to take loan to meet lifestyle expense. Limit your EMI at 30% of your income. This limit is for all loans like Home loan, personal loan, auto loan etc. If you have already taken excessive loan try to make repayment of expensive loans. Insurance is vital need today. Keep 10% money for insurance. This limit includes all insurance premium for all family members including health and life insurance. If your insurance expense is very high than you might have purchased expensive polices or you may be over protected. Use this simple Principal for Investment for financial success. Hope you find above principal of investment useful. Personal loan or Gold loan which is best option? Top up Loan Vs Personal Loan – What should you choose and Why?